3 Proven Strategies And 5 Simple Steps To Creating Amazing Walking Bass Lines On Your Guitar! There is something about a walking bass line that is so cool! It is such a recognisable sound to the ear, even if you don’t know what it is exactly, or even what to call it. Synonymous with jazz music, walking bass lines sound equally amazing, if not better, on a guitar! Because on a guitar you have the ability to add chords to your walking bass lines too. The first time I ever heard somebody playing a walking bass line with chords on a guitar, I was totally blown away! From that day on I made it my mission to learn how to play and create walking bass lines myself, as easily and effortlessly as I observed others doing it. Now I want to pass on to you 3 proven strategies, and a simple 5 step process that works every time you want to create a walking bass lines on your guitar! • Learn my 5 step process that takes a simple progression and transforms it into an amazing, sophisticated sounding walking bass line, complete with chords. You’ll sound like a jazz rhythm section on one guitar! • Be shown how to add chords to your walking bass lines for added WOW factor! You’ll knock the socks off those who hear you play! 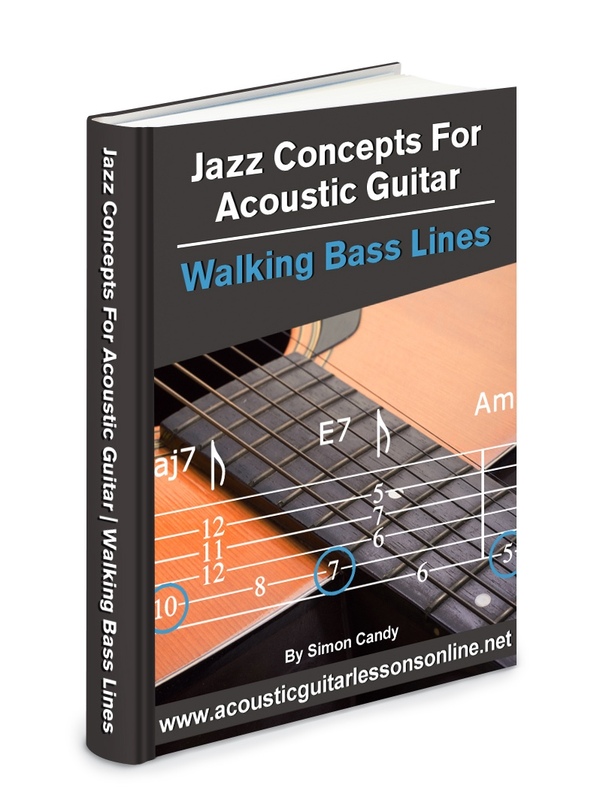 Get free instant access to “Jazz Concepts For Acoustic Guitar - Walking Bass Lines” now. Simply fill out the easy form below, then click the “Give Me Access Now” button. All information is kept 100% private and confidential.